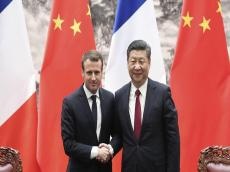 Chinese President Xi Jinping on Sunday stressed the importance of maintaining a sound China-France relationship to both countries' long-term development and its potential impact on the world, Trend reports citing Xinhua. "The history of China-France cooperation shows that bilateral ties are not 'a zero-sum game.' The strong complementarity between the two economies will remain for a long time," Xi said, adding that China's sustained development and further opening-up will create a host of new opportunities as well as broader space for bilateral cooperation.